After arriving in Kigali last month, the first thing my friends and I did was hire motorcycles and ride around the city. It was the best way to get reacquainted with it and take in all the sights and sounds and smells – it was cheap therapy. For a few moments during that ride, it didn’t feel like I was in Africa. Kigali over time has developed into a lovely city. The growth is something that you see when you meet the locals and look at the infrastructure. A country once wounded so badly is shining and we Africans are all visibly proud. The story that is being told about Rwanda is that where there is a will, there is a way. When the 1994 genocide happened, I was eight years old. I vividly remember huge black helicopters hovering over us for days. There were lots of gunshots and very loud bangs, which my parents told me were ‘bikompola’ (bombs/grenades). I didn’t understand what was going on but I took notice of everything. I come from a small district south west of Uganda, which borders Rwanda. The effects of the genocide happening to our neighbours were very visible. Fast forward 20 years on to October 2014. I got to visit Rwanda again, this time to attend an African Union-hosted forum where we discussed Silencing the guns: Women in Democratisation and Peace Building in Africa. It was a pertinent theme – some African countries have barely known peace for up to 50 years. The continent has been in constant turmoil and conflict, and it is widely known that women and children bear the brunt of it. Initiatives like this pre-forum aim are aimed at including them in the process of peacebuilding rather than keeping them on the periphery. The African Union has a vision for the continent for the next 50 years known as Agenda 2063. One of many goals is a peaceful and secure Africa. “By 2020 all guns will be silent. Mechanisms for peaceful resolution of conflicts will be functional at all levels. A culture of peace and tolerance shall be nurtured in Africa’s children and youth through peace education.” This is why the conversation on silencing of guns was very relevant and timely. 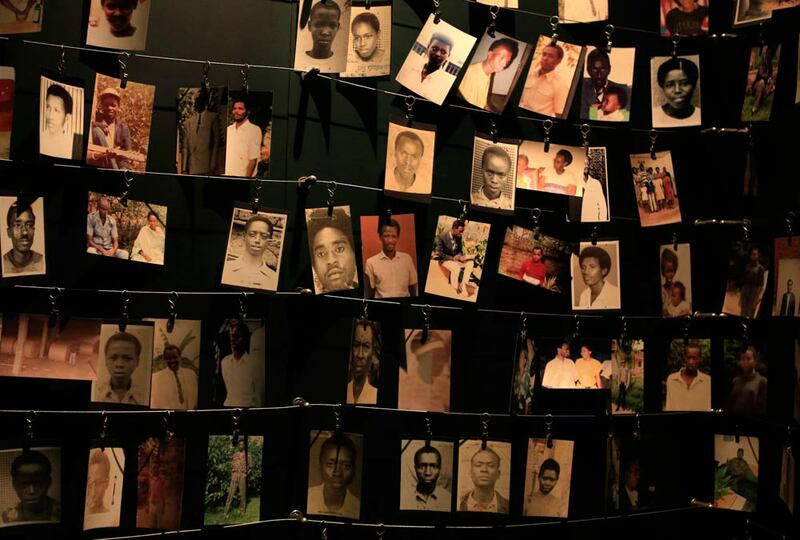 Rwanda’s post-genocide story is unique in so many ways. Speaking at the event, Dr Aisha Abdullahi, commissioner for the AU department of political affairs, said: “Rwanda is a shining example that we can forgive, that we can achieve healing and reconciliation, that we can prosper even when we do not have oil or minerals. Effective governance is key”. However women have got to be at the centre of the processes involved, she emphasised. Women bring to the table a unique way of governance – the kind that is sentimental and well thought-out. We are relational beings and while all we do and should listen to the facts and the judge, women bring the ‘Ubuntu’ aspect as well. While in Kigali, we went to visit a reconciliation village in Bugasera, a short distance away from the city centre. We heard testimonies from women who, after the genocide, turned their sons in to the authorities as they suspected they had been involved in the violence. They needed to go through the systems, either go to jail or to a reconciliation camp, one mother said frankly. In Rwanda (and elsewhere), it is women who hold communities together. It is their husbands and children who were killed, it is their brothers and sisters who were wounded, but that does not stop them from advocating for equal justice for all. And history and scholars are on their side. Over the past couple for years economists have agreed that there is nothing more central to development than the economic, political and social participation and leadership of women. They go on to say that this is particularly true in post-conflict societies where women often make up the majority of the population. Women have the primary responsibility of raising the next generation. The majority of refugees are women and children, and not just in Africa. Female education, increasing women’s authority and uplifting their political voice have a profound effect on development in post-conflict situations. And this is what Rwanda has done. The have given women more control over resources, which is very important. We see it in our everyday lives: women will tend to give more and invest more in the livelihood of their homes and communities. In other countries around the world, only about 20.4% of the members of parliaments are women. Rwanda prides itself on having the highest percentage of female MPs in the world – nearly 64%. Rwanda is an example of the new trend to use electoral gender quotas to fast-track gender balance in politics. Africa has only six years to be able to achieve reconciliation and silence guns on the continent as per the aspirations of Agenda 2063, but one thing remains: effective governance is the only road to getting us to achieve a peaceful and secure continent. But women have got to steer the conversation, be a part of it and also be acknowledged by the very many partners in the process. Ruth Aine is a Ugandan blogger and social media trainer. She blogs at aineruth.blogspot.com. Justin Mugenzi was legally cleared of any role in Rwanda’s 1994 genocide. But an oversight in the international justice system means he remains a virtual prisoner in a United Nations safe house in the eastern African state of Tanzania. “My wife and eight children are all Belgian citizens now,” the 75-year-old former trade minister told Reuters in Dar es Salaam after submitting a third – and unsuccessful – visa application to the Belgian embassy there. “I have nowhere else to go,” said Mugenzi. Despite his acquittal last year by the International Criminal Tribunal for Rwanda (ICTR), based 650km further north in the city of Arusha, he is too scared to go back to Rwanda, where political rivals now hold sway. The ICTR is scheduled to hand down four more verdicts on Monday, potentially creating more such limbo cases. The plight of Mugenzi and others like him is a setback to years-long efforts to create a system of international justice by using special courts such as the ICTR – set up to try those accused of carrying out the Rwandan genocide – or permanent tribunals with a more general remit such as the Hague-based International Criminal Court. Backers say such courts are needed to deal with the world’s worst criminals: perpetrators of genocide, war crimes and crimes against humanity. But some doubt their legitimacy, pointing to the ICC’s patchy record in securing convictions. The ICC’s critics say it ignores crimes in the West to focus on Africa. The collapse through lack of evidence this month of the case against Kenyan President Uhuru Kenyatta – accused of stoking ethnic violence after Kenya’s 2007 elections – was a new blow to its credibility after a string of failed prosecutions. Arrangements exist for witnesses to resettle or for defendants to go to jail in third countries. But when the tribunals were created in the early 1990s, no one imagined that those acquitted would be either unable or unwilling to go home. International law experts say this snag could further undermine confidence in the courts. “How can we possibly consider a system to be fair if before the trial, the tribunal makes lots of arrangements about where to put the defendants in jail if they’re convicted but makes no arrangements at all for what’s going to happen to them if they’re acquitted?” said Kevin Heller, Professor of Criminal Law at SOAS, University of London. Like Mugenzi, 10 other individuals acquitted or freed by the ICTR are living in a safe house – in limbo in a country that is not theirs. “We couldn’t leave these men on Arusha’s sidewalks, with their small suitcases, no pocket money and not the slightest idea of where they would go,” said Pascal Besnier, chief of the judicial and legal affairs section at the ICTR. But what was intended as a temporary solution when the first acquittal was handed down in 2001 is still in place. Only six men have been resettled – in France, Belgium, Switzerland and Italy. The safe house’s longest-standing resident has been there for over 10 years. This month, an acquitted former general joined his family in Belgium – the first to leave since 2010. Tanzania tolerates their presence under UN surveillance but other countries are not keen to welcome them. Francehas taken in two and believes others should now step forward. Each resident costs $1 500 a month including rent, telephone, cooks, guards and other outgoings. The house, paid for by the United Nations and guarded by Tanzanian police, is almost full even before Monday’s fresh set of verdicts. In a statement to the ICTR, Kigali said it would welcome the acquitted and respect the ICTR’s verdicts. “The official position of the Government of Rwanda … is of respect for decisions of courts, including the ICTR, irrespective of whether the Government, Civil Society or any other person or body perceives them to be less than fair”, said the Ministry of Justice. 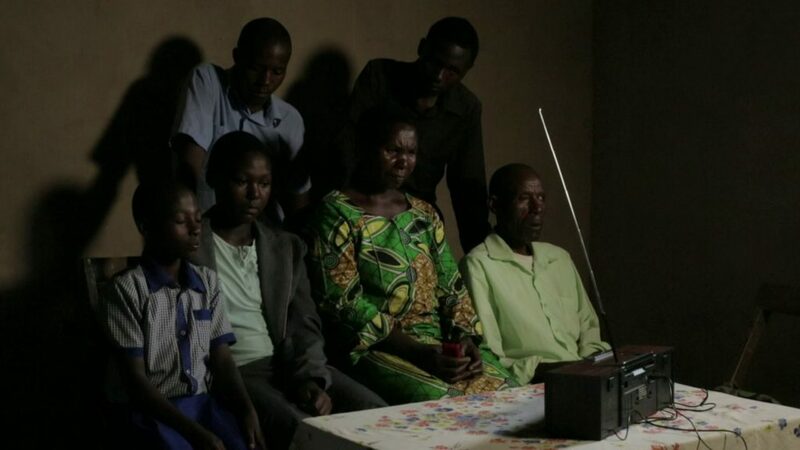 But after Mugenzi and his family fled Rwanda 20 years ago, he has nothing to return to. He fears for his safety in a land where his acquittal was condemned at public demonstrations. Some of them have “well-founded fears” of going back, said Human Rights Watch senior Africa researcher Carina Tertsakian, adding that they risked being prosecuted on other charges. “It may well be that those people have a case to answer but our concern has to do with whether the process of justice would be fair,” she said. 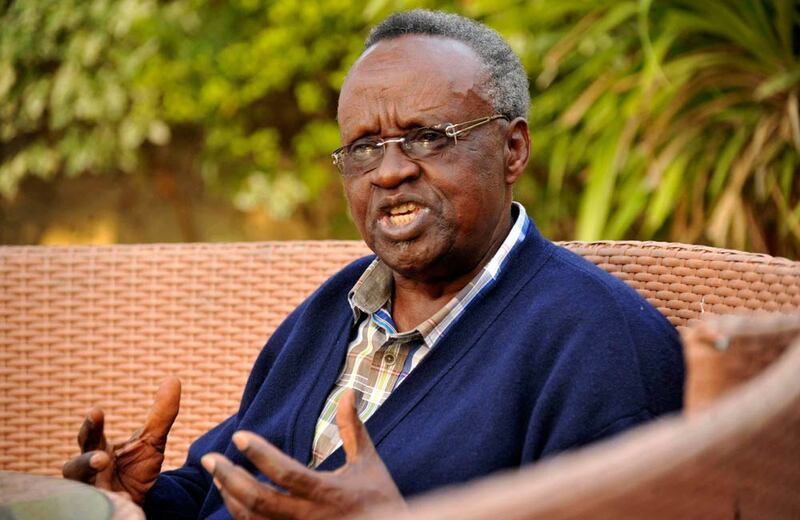 Contacted by Reuters, Rwandan Justice Minister Johnston Busingye denied there would be any attempt to make them face similar charges if they returned. “I can assure you that nobody would say, ‘Now they have survived conviction for genocide I am going to hit them with genocide denial or ideology or divisionism’ – nobody!” he said. Applying for refugee status is a long shot for them. Having been accused of the worst crimes is often enough for an application to be rejected. The Western countries in which they have families are increasingly reluctant to receive them, not least because of a rise of anti-immigrant sentiment that has accompanied Europe’s protracted economic downturn. “The potential public reaction might be quite an issue,” said Belgian Justice Ministry official Adrien Vernimmen. According to the ICTR statute, states must assist the tribunal, including in the arrest and detention of defendants. But it does not mention the relocation of acquitted individuals. Neither does the Rome statute, which created the International Criminal Court (ICC). Yet, with only two convictions and one acquittal so far – all being appealed – even the ICC is already facing this issue. Mathieu Ngudjolo Chui, a former Congolese militia leader acquitted in 2012 after prosecutors failed to prove he ordered atrocities in eastern Congo in 2003, has lodged an asylum request in The Netherlands saying he will be persecuted after he testified against Congolese President Joseph Kabila. ICC officials play down the issue. “So far there is one acquitted person. He didn’t want to go back but nothing tells us that that will be the norm for the future,” said ICC registrar Herman von Hebel, adding he was sure Ngudjolo could return. Yet, the problem could come up in future. If acquitted, would former Ivory Coast President Laurent Gbagbo want to return to a country led by his rival Alassane Ouattara and where his wife, who also faces ICC charges, sits in detention? Experts fear this could hurt the image of international criminal justice, already criticised for its alleged slowness, selectivity and alleged shortcomings of its prosecutions. “It is a human rights issue that the international community, through the UN, takes over criminal proceedings and then doesn’t complete the work and reinstate people who have been acquitted by our system,” said the ICTR’sVagn Joensen. Von Hebel said he was confident the ICC would be able to build a wider network of states willing to help in the future. But international tribunals, by definition dependent on states’ cooperation, have no means of forcing them to comply. With the ICTR due to close next September, observers wonder what will happen to the remaining residents of the safe house. The tribunal says it will find a solution for the time being. “As long as those people have not found homes elsewhere, we will try to continue helping them,” said judge Theodor Meron of the ICTR. In the longer term, says David Donat Cattin, secretary general of Parliamentarians for Global Action, a network of international lawmakers, it boils down to political will. The first and only time I had been in Kigali before was in 2009 and I saw only a little of it. I remember that I was unable to complete my tour of the holocaust memorial for the emotion that overtook me; successive rooms of shelves stacked with hacked and broken skulls, the skulls getting smaller as you progressed through the dark display. My tour didn’t last long and I left there quickly, only to be shown the bridge from which mothers were forced to throw their children into the river far below. The place left an impression on me. The last 50 kilometres of Ugandan road, to the border with Rwanda, is hardly a road at all. The potholes are huge and our vehicle jolts and shudders with the unremitting impact of those potholes we fail to avoid. My back starts to hurt and I’m very irritable by time we reach Katuna, a small border town on the verge of Rwanda. It takes standing in a queue for half an hour to exit Uganda. Then, after a short walk to the Rwandan side, there’s no one at all to delay us. The stamp on my South African passport is simply routine and the customs declaration for our car is handled efficiently. Our journey continues. The machine gun-toting policeman checks our passports, swings the boom and politely ushers us into Rwanda. Immediately we change to drive on the right hand side. Suddenly the road is impeccable, although it is still being cut out of the Virunga mountainside. It is wide, newly surfaced, perfectly cambered, and winds easily down into the nation’s capital, Kigali. 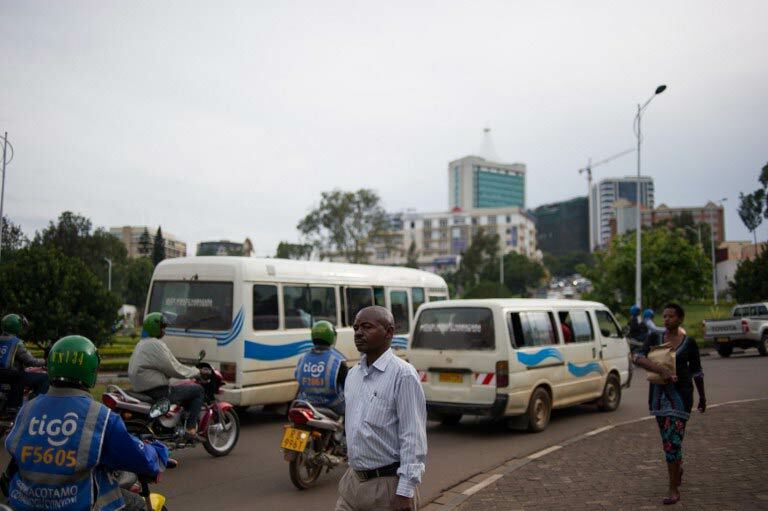 Two hours later, in Kigali, I am first struck by the fact that the city is spotless and inhabited only by well-dressed people going about their business. Shoppers are carrying big brown paper packets and I am told that no plastic packets are allowed. It’s midday and there’s no sign of a traffic jam anywhere. The dual-lane bypass sweeps through the city, out and on. Unlike Kampala, where simply everywhere is a trading zone, Kigali is highly ordered, zoning regulations clearly in force. There’s no one selling cooked chicken pieces on dusty sidewalks. In fact, there are no dusty sidewalks; on the sides there’s paving, and at the centre of the dual carriageways are well trimmed lawns and palm trees. While Kampala might have the highest per capita number of motorbike taxis in Africa, Kigali must come a close second. But again, Kigali is different. Whereas riding a motorbike taxi (‘boda-boda’) in the vehicular mayhem of Kampala poses threats to life and limb (especially without a helmet), Kigali riders are sedate, controlled, everyone wearing protective headgear, colour-coded according to the mobile service provider that sponsored it; green for MTN and blue for Tigo. 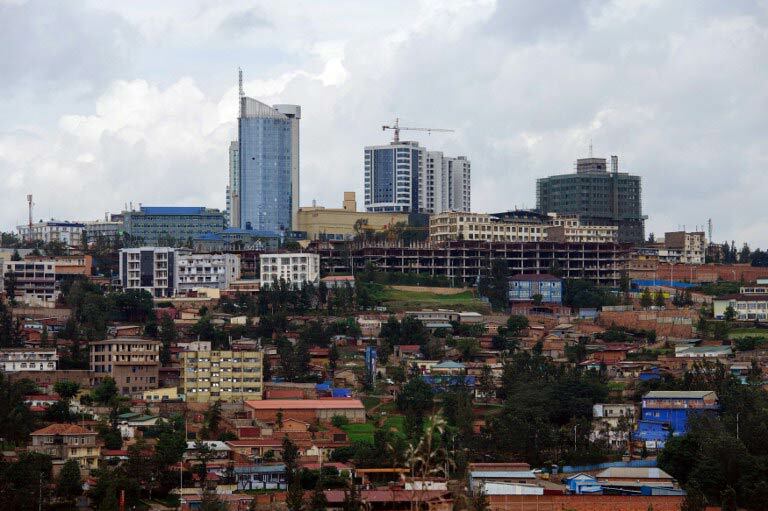 Both Kampala and Kigali are cities built on hills and both cities are widely spread out. Large sections of Kigali’s hilly suburban areas are beautiful, the older parts very reminiscent of the older parts of suburban Cape Town; narrow, meandering roads wind around the hills and you even find the occasional cobbled street. During my week-long stay, the Rwandans I meet speak their own language (Kinyarwanda) and although almost everyone is fluent in French, the language is seldom used despite the fact that the locals I meet have names like Jean-Baptiste, Philippe and Patrice among them. Kinyarwanda sounds a bit like a Bantu language mixed with Russian. It is not an easy language at all, but that the colloquial version is infused with variations on many Swahili words makes it a little easier for me to understand. Some of it I get, at least. And many Rwandans are fluent in Swahili too. “English is problem,” I am repeatedly told. On Saturday night I am taken out to see the Kigali night-life. It is sedate by comparison to Nairobi and Kampala too. People are well dressed and well behaved and I hear smatterings of French being spoken around me. People drink cognac and expensive whiskies more than beer. Around midnight the place starts to empty and by 1am we are heading home. Patrice, my host, is a connoisseur of fine spirit liquors and we stop at Kigali’s only 24-hour liquor store. Instead of the cheap liquor one might expect to find in a store that services the needs of the all-night drinker, this one stocks mainly Hennessy, Johnny Walker Black Label, Chivas Regal and Jack Daniels. “This place will finish me,” Patrice says as he hands over more than $100 for a bottle of Johnny Walker. That there is a lot of money in Kigali is obvious from this store alone. My visit coincides with Rwanda marking 20 years since the genocide that happened in the country. 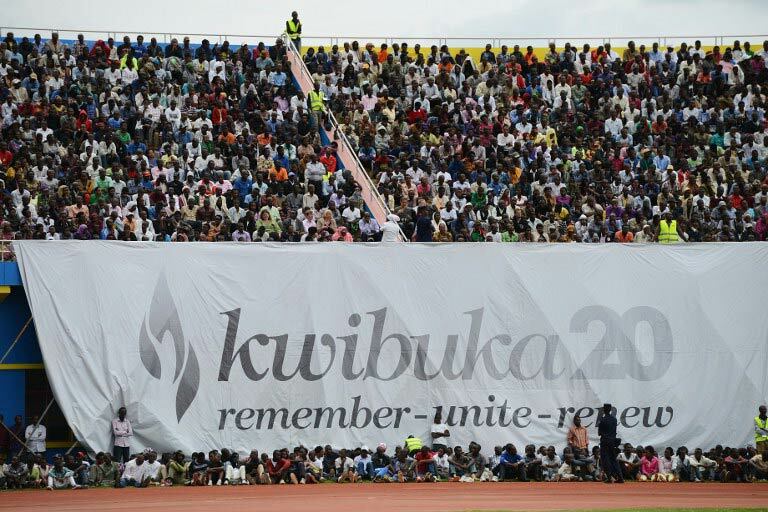 ‘Kwibuka’ is to remember. Remember, Unite, Renew. The Rwandese are not about to forget what happened in 1994. Everywhere around Kigali are large corporate banners with the logo and in the week that I’m there, spending time among Rwandans, I don’t hear the words ‘Hutu’ or ‘Tutsi’ even once. The genocide is remembered but is obviously not up for discussion any longer. I fly from Kigali International Airport on a RwandAir flight direct to Nairobi. My departure is handled efficiently and we take off only a few minutes late because passengers connecting from Burundi arrive late. The flight takes just over an hour as the pilot makes up for lost time. We land exactly at the expected time of arrival. Things change immediately. At Jomo Kenyatta International Airport it takes nearly an hour to clear Immigration and get my luggage. Nairobi’s perfunctory traffic jam starts at the airport parking area where the pay station has no change. The boom rises as we are told to proceed to the next pay station, outside the parking area. Here the ticketing machine is not working and we have to wait for a half hour for the jam to build enough for a supervisor to let us all go, scot-free. I am left with the impression that Africa can indeed work as the west might expect. From what I saw, Kigali has achieved it. For now, we’ll leave the contentious subject of there being a dictatorship in Rwanda, even if somewhat benevolent. We’ll leave the subject of restrictions on mobility imposed on the local population. We’ll leave the fact that you can’t ride a bicycle into the city, or be void of shoes when you walk there. And, we’ll leave the contention that Paul Kagame is “eating” as much as any other despot in Africa. So too will we leave the contention that Kigali is packed with Kagame’s spies, tracking down any likely suspect. Africa can work, even if its operation is conditional and enforced. Brian Rath was born and raised in Cape Town. He now lives and writes in Kenya, and recently had a novel published.